So, here’s a mini-rant…There are just as many XFS complaints as ext3 complaints on the linux-kernel mailing list. Yep. It is that simple. I can’t stand the fact that some people make a big deal out of complaints about XFS, but are oddly silent (or ignorant?) of the fact that there are just as many “problems” with Ext2/3. I’m not even considering Ext4, as it is in development. So, I was in #linuxfs on OFTC, and a whole discussion happened about XFS and ext3. Eric Sandeen was working on fixing up few bugs in ext3 to make it work on 16TB of storage. I couldn’t help but mention XFS. The discussion then evolved into XFS is a large pile of code that is really nasty in places (I do agree with that) but it still performs very well. Eric pasted a link to this image (I copied it for archival purposes.) 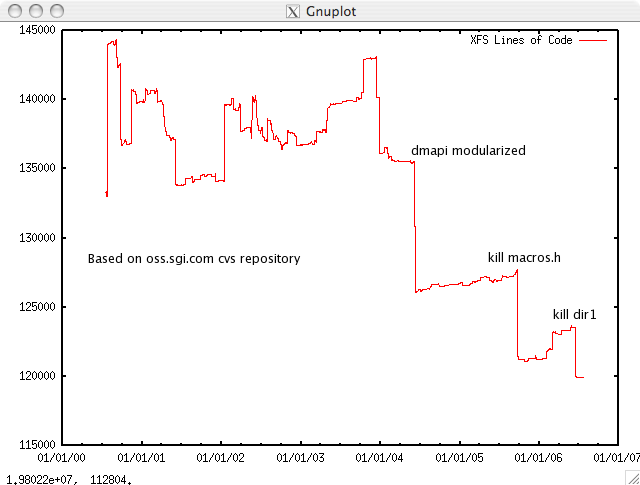 which shows the code size of XFS over time. It is actually kind of scary.